Hey! I'm so sorry I've been away, I promise I'm back for good! Over the last 2 weeks I celebrated others' Spring Breaks (post to come later this week,) started working out again, visited friends and family, and spent some quality beach time. But I'm back. With recipes, OOTD's, and coming soon, a new blog design. I have been searching everywhere for a rose gold nail polish, but had not found anything similar until last week. I had bought Orly 'Rage', as it's a slight rose gold, but it just didn't cut it. 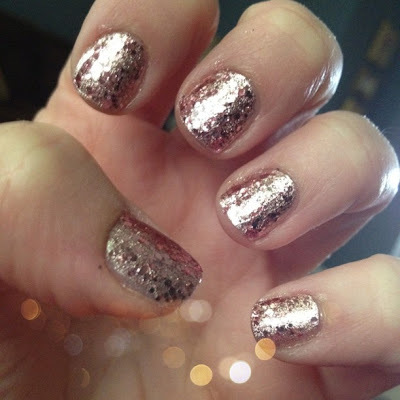 I saw this manicure on a blog through Makeup Alley, but didn't bookmark it, so I cannot claim the source of the idea! It was the site that did the poo April Fool's Manicure, but even after googling that, I couldn't find it! Above is a bottle pic of Orly 'Rage' and Essie 'A Cut Above'. The mani took one coat of Rage, and 2 coats of 'A Cut Above.' And I can't stop staring at it. It's absolutely stunning. So, what do you think...spot on, right? It was difficult to remove, it will definitely take the foil method or a lot of patience! You can pick up Orly 'Rage' at CVS or Sally Beauty Supply, and Essie 'A Cut Above' can be purchased at Target, CVS, Ulta, etc. Welcome back! I am excited to see your up coming posts! This mani is darling. I have the Essie color and just need the base color. Ok I need to go pick up Orly Rage like TODAY!! Love this!